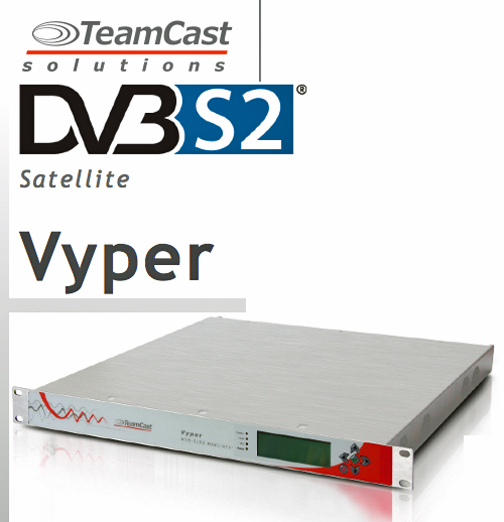 [SatNews] TeamCast is introducing the third generation of their successful Vyper satellite modulator at CABSAT 2015. This new Vyper combines two products in one, offering both IF and RF (L-band) signal outputs on a single product for maximum flexibility in system built-up, operation and maintenance. Additionally, Vyper offers CID insertion, responding today to the short term requirements for use in the USA (2016 for DSNG application, and 2018 for all applications) and is, therefore, ready for the future, worldwide. Vyper also supports multi-stream operation through IP inputs, in addition to multi-stream through ASI inputs. Vyper is also DVB-S2X compliant, with new MODCOD, 64APSK modulation and low Roll-Off values, like the previous model was, for maximum transmission efficiency. "Vyper is continuing its road towards optimized operational capabilities, with a long term view, and best return on investment to our customers, thanks to its unique evolutionary platform," said Christophe Trolet, Business Unit Manager at TeamCast.